I've been on a real finishing spree these last couple of weeks! Last night I put the finishing touches on Daisy. I'm so pleased with how she turned out! 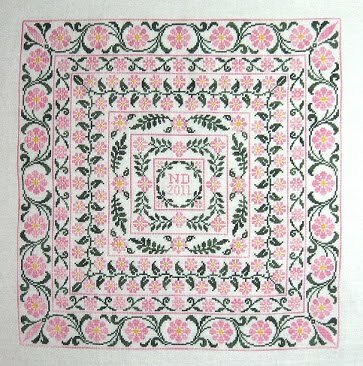 This is stitched 1x2 on 40ct Lakeside Magnolia Linen, using Crescent Colours Belle Soie threads. I spent the morning getting the chart all put together and will be sending it along to my distributor shortly. It certainly makes me feel like spring even though it's snowing (again). I was going to start Rose, but I really want my next model start to be Antique Lace. I'm really itching to do that one!! So, while I wait patiently (yeah, right!!) 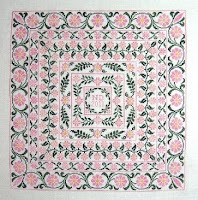 for my materials for Antique Lace to arrive, I decided to work on Spring Quaker for a little while. I didn't get much done last night but I'll show it off anyway. I changed the threads to Belle Soie and brightened up the purples and of course I switched to 40 ct instead of 28 and I'm using Desert Sandstorm from Sassy's. I love how it's turning out, but all this colour changing does do my head in. If you're interested in my conversion let me know and I'll post it. :) The red in it, Tulip, has to be one of the most amazing reds I've ever seen. It's so clear and true, not blue, not yellow, just perfect. Oooooh and I got some pressies in the mail!! Susan from SJ Designs sent me some wonderful bead samples to test out for Antique Lace and they are just divine. I love, love, love the little pearls and I'm leaning towards them for the design if they work out the way I hope they will! I fear they might be a little bit of overkill given there are over 1000 in the design, so once I get a bit stitched I'll give them a test drive. And something frustrating, albeit amusing. I've been applying for part time jobs, things like receptionist, secretarial, data entry, etc. Dr's orders, I can't be on my feet all day, so it really limits what I can apply for. I don't want full time, I want 2-3 days per week, just to top off Jon's income and leave me time to keep up with the designing. I pretty much state that in my cover letters, because I don't want companies to think I'm going to leave as soon as I find full time somewhere else. I found a couple that would be perfect - and one of them replied asking why, with my qualifications, would I want to be a receptionist and that I was much too over-qualified. Makes me wonder if they actually READ the cover letter. Rolling my eyes here. Daisy looks wonderful!! Happy dancing for you! What a nice little start! Can't wait to see more! Ihope you find some work! Just keep plugging away! Something will come your way, and it will be just what you need!